Remastered on black 150 gram vinyl, 2018. 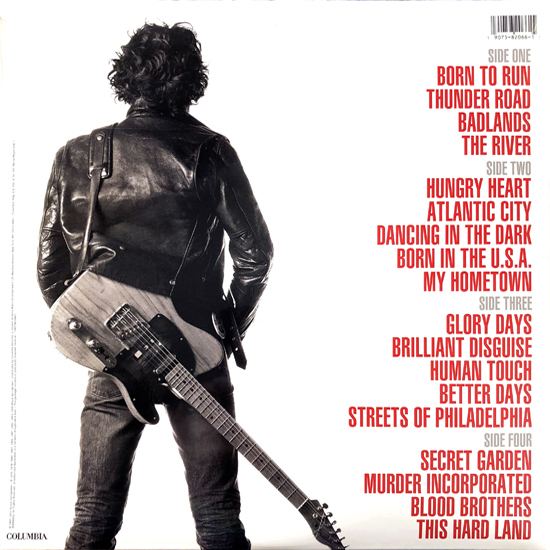 As with the original, includes gatefold jacket with Springsteen's handwritten song notes, photos/lyrics on the inner sleeves. Greatest Hits is absent from the Album Collection Vol 2: 1987-1996 box set and rounds it out nicely -- it ain't fully 1987-1996 without "Streets of Philly." 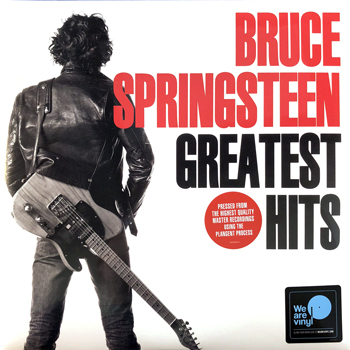 Originally released in 1995, Greatest Hits was Bruce Springsteen's first such collection, gathering classics from the first two decades of his career and including his most recent smash "Streets of Philadelphia." Side Four also kicked off an exciting new chapter in his story with some brand new E Street Band recordings and long-admired, previously unreleased outtakes. Long unavailable on vinyl, this 2LP set is assembled from the brilliant remasters of Springsteen's discography by Bob Ludwig and Tony Scott, utilizing the Plangent Process for transfer from the masters.